MPhil (1st Class Hons); BA (Soc Sci); NZCS (Chemistry); Cert in Celebrant Studies; CANZ Accredited Celebrant. Kathrine’s interest in ceremony was sparked in the 1990’s when she attended a particularly unsatisfying funeral for a family friend. 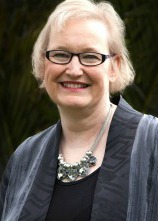 She enrolled for and completed the Certificate in Celebrant Studies with course founder, Mary Hancock. Some years later, when Mary established The Celebrant School, she invited Kathrine to join the new Advisory Board. In 2011, having served the Celebrants’ Association of NZ Inc in a number of capacities, Kathrine was elected National President. She led the organisation on a path of regeneration, helping it strengthen and unify celebrants. After completing her term, she joined The Celebrant School as a lecturer, and in 2016, she succeeded Mary as Director. She brings to the role her diverse career experiences spanning scientific research, industry training, organisation development consulting, education management, and of course, celebrancy.